Terminal 5 at London Heathrow Airport, United Kingdom. This is the busiest airport for international passengers. An airport terminal is a building at an airport. It is where passengers are able to get on and off aircraft. Inside the terminal, passengers can buy tickets, leave or pick up their luggage, and be checked by security staff. The buildings that provide access to the airplanes through gates are usually called concourses. However, the words "terminal" and "concourse" are sometimes used to mean the same thing. Small airports have only one terminal, while large airports can have several terminals and/or concourses. At small airports, the single terminal building usually has all of the functions of a terminal and a concourse. Some larger airports have one terminal that is joined to multiple concourses via walkways, sky-bridges, or underground tunnels (such as Denver International Airport). Some larger airports have more than one terminal, each with one or more concourses (such as New York's LaGuardia Airport). Still other larger airports have multiple terminals each of which includes the functions of a concourse (such as Dallas/Fort Worth International Airport). Most airport terminals are built in a plain style. 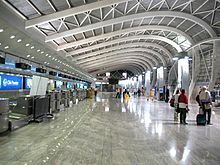 However, some, such as Baghdad International Airport, are grand monuments, while others are considered architectural masterpieces, such as Terminal 1 at Charles de Gaulle airport near Paris or Terminal 5 at New York's JFK Airport. A few are designed to reflect the culture of an area. The terminal at Albuquerque International Sunport in New Mexico, is designed in the Pueblo Revival style made popular by architect John Gaw Meem. The terminal at Bahías de Huatulco International Airport in Huatulco, Oaxaca, Mexico, which features some palapas that are interconnected to form the airport terminal. Many early terminals were built in the 1930s–1940s when air travel become popular. They are often in the art deco style architecture of the time. One such example from 1940 is the Houston Municipal Airport Terminal. Early airport terminals opened directly onto the tarmac: passengers would walk or take a bus to their aircraft. This design is still common among smaller airports. Many larger airports have "bus gates" to access aircraft which are parked beyond the main terminal. A pier design uses a long, narrow building with aircraft parked on both sides. One end joins to a ticketing and baggage claim area. Piers can hold a lot of aircraft and are simple to design. They can often result in a long distance from the check-in counter to the gate. At Kansai International Airport this distance is half a mile. Most large international airports have piers, including Chicago's O'Hare International Airport, Larnaca International Airport, Frankfurt International Airport, London Heathrow Airport, Rome Fiumicino Airport, Amsterdam Schiphol Airport, Murtala Muhammed International Airport, Kuala Lumpur International Airport, Bangkok International Airport, Beirut International Airport, Hong Kong International Airport, Allama Iqbal International Airport and Miami International Airport. Brussels Airport's Pier A is joined to the main building by underground tunnels and walkways. Zurich Airport's Gates E are joined with a subway. At Logan International Airport in Boston, Terminal A has two sections of gates, one of which is a satellite terminal joined by an underground walkway. Denver International Airport, General Mariano Escobedo International Airport, Cincinnati/Northern Kentucky International Airport, and Hartsfield-Jackson Atlanta International Airport have linear satellite terminals joined by central passages. Kuala Lumpur International Airport has a cross-shaped satellite terminal which is being used for international flights. Seattle-Tacoma International Airport has two rectangular satellite terminals connected by an automatic people mover system. Jinnah International Airport in Karachi has one main terminal, divided into two concourses: the Jinnah East Satellite Concourse, used for international flights, and the Jinnah West Satellite Concourse, used for domestic and some international flights. McCarran International Airport in Las Vegas has an X-shaped satellite terminal that is joined by two automatic people movers. Some airports use a semicircular terminal, with aircraft parked on one side and cars on the other. This design results in long walks for passengers changing aircraft, but greatly reduces travel times between check-in and the aircraft. Airports designed around this model include Charles de Gaulle International Airport (terminal 2), Chhatrapati Shivaji International Airport, Mumbai (terminal 2), Dallas/Fort Worth International Airport, Seoul's Incheon International Airport, Toronto Pearson Airport, Kansas City Airport and Sapporo's New Chitose Airport. Another unusual terminal design is the mobile lounge. Passengers are taken from the gate to their aircraft in a large vehicle which docks directly to the terminal and the aircraft. Washington Dulles International Airport, Mexico City International Airport, and Mirabel International Airport have used this design. A mix of layouts also exist. San Francisco International Airport and Melbourne Airport use both a pier-semicircular layout and a pier layout. 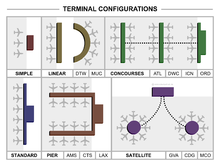 Common-use terminal designs means airlines share check-in counters, gates and IT systems. Check-in counters and gates can be used by airlines as needed. Dubai International Airport, Dubai, United Arab Emirates, Terminal 3, is the largest single Terminal building in the world. It had an area of over (1,500,000 m²) when it opened on October 14, 2008. It can handle an excess of 43 million passengers. Beijing, Hong Kong, Bangkok and Mexico City have the world's second, third, fourth and fifth largest single terminals (986,000 m2, 570,000 m2, 563,000 m2 and 542,000 m2) in Beijing Capital International Airport, Hong Kong International Airport, Suvarnabhumi Airport and Mexico City International Airport. Many small and mid-size airports have a single two or three-lane one-way loop road which is used by local private vehicles and buses to drop off and pick-up passengers. An international airport may have two one-way loop roads, one for departures and one for arrivals. It may have a direct rail connection by regional rail, light rail, or subway to the downtown or central business district of the closest major city. The largest airports may have direct connections to the closest freeway. There will be car rental agencies and taxi companies at the terminals. The Hong Kong International Airport has ferry piers on the airside to connect with ferry piers across the border. ↑ geographer, Matt Rosenberg Matt Rosenberg is a professional; book, writer with over 20 years of experience He is the author of both a geography reference; contests, a guide to winning National Geography Bee. "Where Are the 30 Busiest Airports in the World?". ThoughtCo. ↑ "Engineering News-Record - ENR". www.enr.com. ↑ "New Terminal 3 to evoke 'tranquillity' - The National".